Flat out to keep bathroom floors flat! Last week I wrote about carpets and laminate floors. 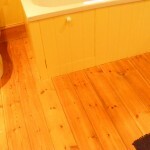 I said I’d write about floors for bathrooms this week, and waterproof laminate flooring in particular, so here goes. I never fit MDF based laminate floor in bathrooms. I’ve seen products which claim to be suitable for bathrooms, made of very highly compressed MDF with a high resin content. These products are still not truly waterproof, the moisture always gets into the joints somehow, curls up the edges and they don’t stay flat. There’s a new product called Aquastep, made by Quickstep, which isn’t a laminate in the true sense as it’s entirely plastic, so impervious to water. I fitted a room with it recently for a client and it goes down quite well. It’s expensive at about £25 a square metre, so at that price, it’s worth considering fitting tiles instead. Tiles are probably the best option for durability in the bathroom if you can afford them. They can’t be fixed straight to a wooden floor, but need a backing board of a minimum 12mm plywood, with lots of screws holding it down to stabilise the existing floor, which also needs to be screwed down thoroughly to the joists beneath. Alternatively, if the floor is likely to be wet for long periods, use a specialist tile backing board, such as Aquapanel or Hardibacker. I recommend using powdered adhesive, not ready-mixed, if the tiles are likely to remain wet for any length of time. Ready-mixed can soften if left wet for too long. With the extra work and materials involved, tiles will probably cost a bit more than the Aquastep flooring all-in, unless you can get a very cheap deal on the tiles, but tiles laid properly are incredibly durable. Be careful not to fit tiles which are slippery when wet! Engineered wood is a bad idea in bathrooms for the same reason as laminate – water gets into the joints and curls them up at the edges. Oddly enough, solid wood varnished tongue and groove boards perform better than you might think. They swell a bit, but the pre-existing gaps between the boards disguise this so they still look OK.
Vinyl is of course far and away the cheapest alternative. It’s impervious to water, quick and easy to fit, and can be surprisingly durable IF your tenants aren’t too hard on it. It’ll tear with hard use or if heavy objects, such as washing machines, are dropped or dragged along it. Personally I favour vinyl in kitchens and bathrooms because it’s sooooo much cheaper than anything else and I trust my tenants to be sensible, but this is down to the discretion of the landlord. It’s also a good idea to stick the edges down with double sided tape or silicone. Don’t use solvented adhesives like Gripfill as they may dissolve the vinyl. That about raps it up for this week. Ill write about polished boards, engineered wood and underfloor heating over the next week or two.